Some game companies try to build games for the iPhone from the ground up. Others take titles from other platforms and try to cram them into the small iPhone box. EA Mobile is definitely of the latter category, and attempts once again to cram the complexities of its high-end computer games into the iPhone platform. The company’s ambition is to be complimented, but its implementation leads something to be desired. Sim Me: Someday a real rain will come and wash all this scum off the streets of Simville. 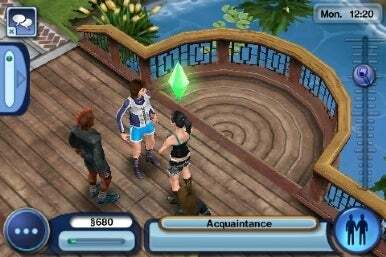 First, the good news: The Sims 3 boasts some of the best graphics you’ll see for the iPhone. 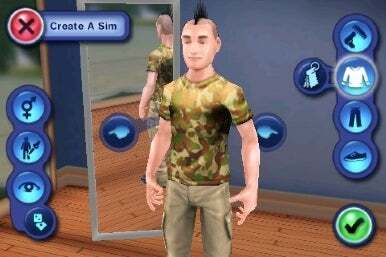 The developers did a great job of simplifying The Sims 3 character customization screen without making it a bunch of paper dolls. Though you’re limited to only one age demographic, you still get a sense of freedom that you can create a unique Sim. The personality traits are also pretty much intact, though the personas (maniac, well-rounded, sleaze, etc) seem redundant with the personality trait selections. Still, the AI is impressive in that each character interacts independently according to their predefined personality traits and persona. Live as a maniac who enjoys talking to trees or a jerk who kicks over peoples’ trashcans for fun. You can also let your Sim be self-sufficient and they’ll take care of their basic needs (food, sleep, hygiene) by themselves. It’s this kind of sophistication that often goes unnoticed in a game, and it definitely places EA Mobile among the best in the world right now for its abilities to convincingly create characters that interact in believable, unpredictable ways. The mini-games are infrequent, but actually represent the best use of the iPhone’s unique control setup in the game. To fish, you guide your lore with your finger and then yank the phone back when you’re reeling it in. Similarly, the cooking mini-game has you shake the iPhone in order to shake the pots. The biggest complaint I have concerning the mini-games is that there are far too few of them. Actually, that’s the larger issue with The Sims 3: there isn’t much to see or do aside from dress up your Sim’s apartment, babysit their bodily functions and maybe build relationships. Your career paths are limited to only a handful of jobs, the town only has a few commercial buildings, and there are about eight homes with everyone in the same age bracket. Getting around town is no easy task, either. The map view in The Sims 3 for Mac ( ) was an icon-based system that let you click where you want to go, but the map view for the iPhone version is essentially a middle-zoomed birds-eye view where your Sim appears as a strangely highlighted gamepiece that you can move around. Moving your Sim to any location will require a confirmation screen for the move and then a load screen— making movement disjointed and frustrating. Occasionally, your Sim will express a wish which will appear as a little icon in the bottom right of your screen. I have no idea what possessed EA Mobile to make these wishes time-sensitive, because some of them are simply impossible to complete when they randomly appear. My Sim wanted a promotion, and because she expressed this wish on a Saturday, the wish expired by the time Monday rolled around and I could actually do something about it. You can’t cancel wishes or get back lost wishes, but the impact completing wishes has on the game isn’t really articulated. Even if I had completed all my Sim’s wishes, I don’t seem to receive any lifetime rewards or anything of that nature. The game will take you over ten hours to complete, and more still to go back and try for the wishes you missed. What’s It All Mean: Ambiguous menus mar the gameplay. Unfortunately, EA Mobile still has difficulties with its menu systems. One of the greatest flaws of Sim City for the iPhone was its ambiguous icons. The Sims 3 for the iPhone really stumbles when it comes to character interaction. By clicking the “relationship” icon in the bottom right corner, occasionally more options will be revealed. Sometimes clicking the “relationship” icon will lead to you having “woohoo” with the character, sometimes it will open a “mean” set of interactions and sometimes it will offer you new “nice” interactions. The ambiguity can be frustrating, and the tendency for interaction options to disappear when you need them handicaps the game in critical moments. If my character is a jerk, I should be able to insult and argue with people all the time. But sometimes, that option disappears all together and I have to rely on creeping them out by going in for a hug. The game ran decently on my iPhone 3G, but with some moments of slow down particularly when my character was changing clothing. It crashed occasionally during these moments of slowdown, though I haven’t been able to replicate the problem consistently. At $10, this is a high-end targeted game with an obviously high-end price. While The Sims 3 for Mac is essentially a never-ending buffet of activities to do, The Sims 3 for iPhone is a high-priced taster appetizer. It’s not enough to fill you up, and you’ll be frustrated by the small selection. Until EA Mobile can figure out how to consistently deliver an intuitive interface and a fun playing experience to compliment its high-end graphics and AI, the resulting games will continue to play like cheap knock-offs of the computer games they’re based on. The Sims 3 is compatible with any iPhone or iPod touch running the iPhone 2.2 software update.